“Electric scooter for adults” may come across as an oxymoron, being that we typically picture these vehicles as toys appropriate for small children. It is true that toys are meant for children, although URB-E presents adults with a fun, convenient, and efficient alternative of their own. Not only is riding an URB-E an experience that rivals the wind-in-your-hair thrill of the childhood scooter, but its speed, safety, and portability make it the ultimate commuting device. With an 18 mph top speed on the Pro models, and a 14 mph top speed on the Sport series, URB-E is a quick and fully electric method of commuting. Since it only takes a few hours to charge (which lasts up to 20 miles) our vehicles are ideal for that last-mile of your commute on public transportation as well as local riding. Razor scooters and other transportation methods of the like lag behind when it comes to electrically-powered high speeds, making them no match for the efficiency of our electric scooter for adults. The idea of a motorized electric vehicle may not sound like the safest transportation option at first, but the comfort and maneuverability of URB-Es make them the safest of their competitors. Because the rider’s feet are only 3-4 inches off the ground, it’s easy to find balance and maneuver around pedestrians. Also, the ultra-responsive throttle and low center of gravity give the rider good control even at low speeds, an area that causes cyclists problems in big crowds. Our riders range from teenagers to 80-year-olds, proving the URB-E is safe and dependable for almost any ability level. Other electric vehicles like Ojo Electric scooters and Bird scooters may be able to transport riders quickly, but they are lacking when it comes to portability. What happens when you come to a location that does not allow access to riding, like stairs or indoors? All you need to do is fold up your URB-E to a compact 8 by 12 inches and you can easily carry or roll it when needed. Attach a basket and it makes for the perfect shopping cart! From its compactability to its high speeds and impressive battery life, URB-E is undoubtedly an impressive design. When it comes to a safe, quick, efficient method of electric transportation, URB-E has it all while still giving you that classic, childhood-reminiscent, joy-riding experience. 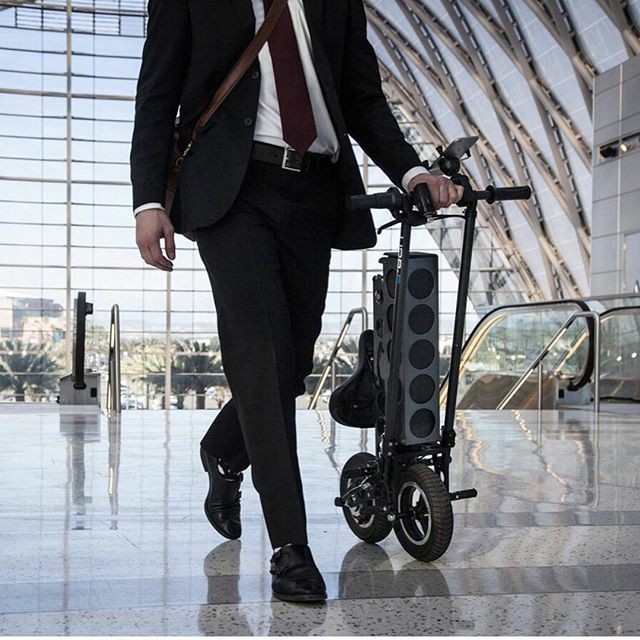 Just call it your electric scooter…for adults.